ARCHBISHOP DESMOND TUTU has urged Norwegians to forgive mass murderer Anders Behring Breivik, the worst criminal in the nation’s recent history. Tutu, a key figure in South Africa’s post-apartheid reconciliation, described Breivik’s crimes as “the worst possible thing that you could imagine”, but added that hatred and bitterness are “corrosive”. “That is our position and … I think this would be God’s position too,” Tutu said when questioned about the appropriateness of forgiving Breivik, who is serving an extendable 21-year prison sentence for killing 77 people in 2011. “God hates no one. We are all God’s children and there are those of us who become bad children but we’re still children, we still belong to the family,” he added. The retired Anglican archbishop made the comments during a press conference at the Oslo Nobel Peace Centre, 30 years after receiving the prestigious award. 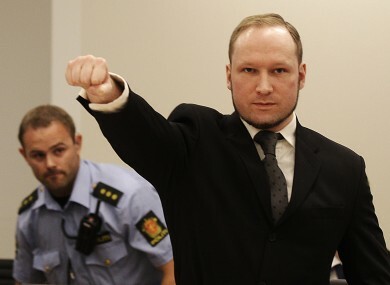 “We have here a mass murderer who doesn’t show any remorse and will not change his personality,” Blattmann told public broadcaster NRK. Quite the opposite, he says that he would have liked to take more lives and that he would gladly do it again. Tutu, an anti-apartheid activist who later became the president of South Africa’s Truth and Reconciliation Commission, is expected to meet Breivik’s main lawyer, Geir Lippestad, in Oslo on Tuesday evening for a debate on reconciliation. Email “Tutu calls on Norwegians to forgive mass murderer Breivik”. Feedback on “Tutu calls on Norwegians to forgive mass murderer Breivik”.